Japan Maritime Self Defense Force (JMSDF) Soryu-class submarine Hakuryu (SS 503) visits Guam for a scheduled port visit, 12 April. 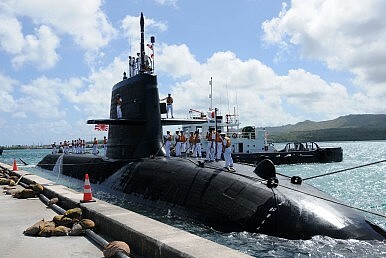 Japan will grant Australia access to classified data regarding the performance of its Soryu-class subs. The battle for Australia’s Collins-class replacement project continues, and Japan is getting ever more serious about its Soryu-class offering. The Japan Times reports, citing Japanese officials, that Tokyo will take the unprecedented step of sharing classified submarine data with Canberra. Japan’s Soryu submarines, widely regarded as one of the most advanced non-nuclear modern submarines, are competing with French and German offerings for Australia’s lucrative Collins-class successor program. The deal is expected to be the largest in Australian defense spending history, amounting to over A$50 billion by some estimates. If Japan shares classified submarine data with Australia, it would mark the “first disclosure of such classified technical data to a foreign military other than that of ally the United States,” notes The Japan Times report. Sharing the technical data will naturally help Australia evaluate the Soryu‘s specifications. One of the questions in the Collins-class replacement project has been whether the Australian Navy would be best served by simply purchasing a design off-the-shelf with few modifications, or if it should look to modify and tweak an existing foreign design to better suit the needs of the Australian Navy. With access to Japan’s technical data, the Australian government will be able to better determine the Soryu‘s operational suitability. The Soryu is in many ways the front-runner for the contract, even though Australia is pursuing a competitive bidding process with three countries. At one point, it seemed all but certain that Australia would grant Japan the contract, but domestic political concerns derailed that initiative. Germany’s Type 214 diesel-electric submarine and France’s Scorpène-class offerings are generally regarded as less sophisticated. All three offerings incorporate air independent propulsion technology, which does not exist in the Collins and considerably augments the operational flexibility and endurance of these boats. The Soryu is also the most expensive offering, with a per unit price of around $540 million (the Type 214 and Scorpène clock in at $330 and $450 million respectively). In Japan, the Soryu bid is an important test of Japan’s ability to compete on the global defense marketplace after it lifted its decades-long self-imposed ban on exporting lethal equipment to other countries. Japan is exploring other defense deals and cooperation arrangements with France, the United Kingdom, India, and Indonesia. For Japanese Prime Minister Shinzo Abe, the Australian contract would represent a major victory in his efforts to galvanize Japan’s defense industry. At the same time, should the Japanese bid succeed, Abe’s critics, primarily in China, will likely cite the deal as an example of Japan’s shift to a more militaristic role in the international system. After studying the the proposals and considering their varying cost efficiencies, Australian industrial involvement options, and capabilities, the Australian government will announce its choice among the Japanese, German, and French offerings. The determination is expected by the end of the year. Australian Prime Minister Tony Abbott is scheduled to visit Tokyo over the summer.